Beyond the typical neighborhood tour: history, heritage, and the cutting edge. The Lower East Side is New York's (and the nation's) great immigrant neighborhood, most notably the gateway for Jews from Eastern Europe. (Some 80% of American Jews can trace their heritage to the Lower East Side.) A visit to the neighborhood offers many signs of that heritage--in religious institutions, social service agencies, labor monuments, and retail stores. But that is hardly the full picture of the neighborhood today. A walk around the Lower East Side reveals complexity and contradiction, with layers of immigration (from Europe and later China) and migration (from Puerto Rico), union-built housing, changes wrought by community organizing, and, most recently, enormous changes wrought by gentrification. 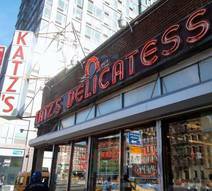 So it's unwise to focus simply on nostalgia, though significant magnet businesses--like Katz's Deli, Russ & Daughters appetizing shop, and Yonah Schimmel Knish Bakery--have bridged the neighborhood's past and present. After years of decline, the Lower East Side has become a "hot" neighborhood, with waves of gentrifiers following the earlier immigrants/migrants, and the artists and nonconformists who embraced the less buffed version of the neighborhood. Your guide's grandparents lived and worked on the Lower East Side. He was taken to the neighborhood as a child by his parents. As an adult, he has wandered, dined, partied, and performed on the Lower East Side. He has even been mistaken for a drug dealer there. We can walk briskly and thus see much more of the neighborhood than most other tours. Our tour typically includes: a visit to Kossar's Bialys, the New York's famed bialy bakery (and right next to the one of the city's best doughnut shops, the Doughnut Plant). Also worth a stop are Yonah Schimmel's Knishery and the Pickle Guys. We will see synagogues converted from churches, former synagogues converted to a church and a Buddhist temple, and even a functioning church that predates immigration. We'll see housing built for the poor and working-class, some of which still serves that function, the new luxury condos that symbolize the neighborhood's gentrification and the new Essex Crossing development project that is replacing, among other things, the historic Essex Street Market (which will return, in a form). We'll view the building that once housed the Jewish Daily Forward, the Educational Alliance that still educates and assimilates immigrants, and the housing built by the activist garment workers union. Other sights include the performance spaces, galleries, restaurants, and nightclubs of the "new" Lower East Side. The neighborhood is by no means a unit; it contains disparate elements geared to newcomers with more money and to longer-standing residents with less. To some degree, the spirit of the old Jewish Lower East Side--a crowded, teeming area with new arrivals--persists: it's manifested in Chinatown, which has encroached significantly on the old boundaries of the Lower East Side. After (or during) tour: Visit Katz's to eat. (Here's an entertaining/informative article and video about Katz's; most staffers are not nearly as obnoxious as the waiter, but he's right to say Get the pastrami.) Many snacking opportunities.